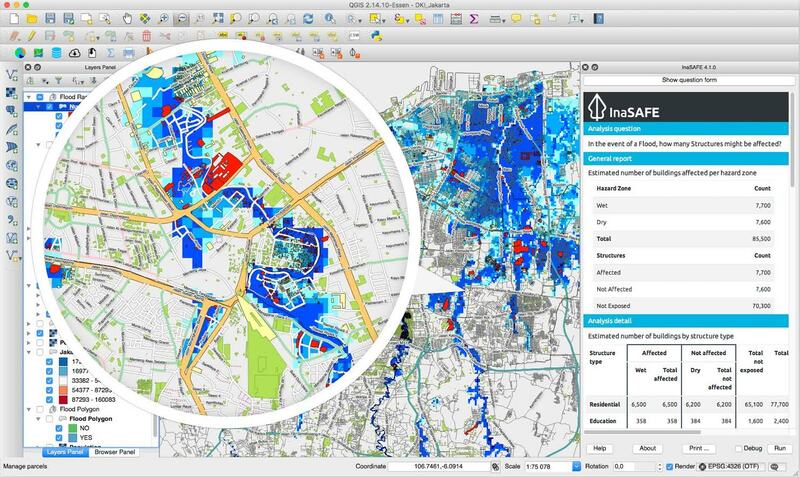 Note: InaSAFE 5.0.0 and greater requires QGIS 3.4 or later. Users of QGIS 2.18 LTR can still use version 4.4.0 of InaSAFE but we do not plan any more releases for the QGIS 2.x platform. Get your free copy of QGIS from the QGIS Download Page. See here for a quick start video walkthrough of installing InaSAFE. 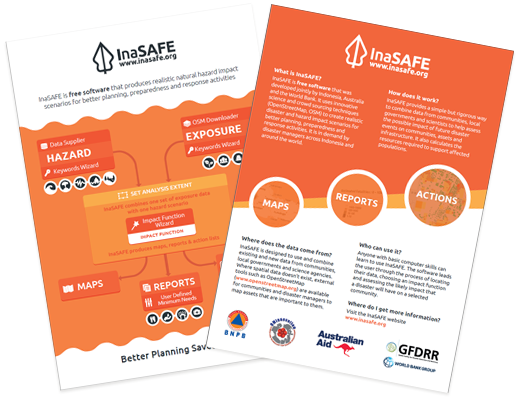 InaSAFE is free software that was developed jointly by Indonesia (BNPB), Australia (Australian Government) and the World Bank (GFDRR). InaSAFE is a Free and Open Source Software (FOSS) project, published under the GPL V3 license. As such you may freely download, share and (if you like) modify the software. We are pleased to announce that InaSAFE 4.2 is released! Team members behind the InaSAFE project will be holding a side event at Understanding Risk 2016. The side event is to be held on the 17th of May 2016 in Venice, Italy. Please come and join us if you can! You can find out more about the event here. Do you want to help find new and interesting ways to use open data for flood emergency planning and response? Floodhack 2016 is a cross disciplinary event for disaster managers, GIS professionals, developers, open data experts, data journalists, designers and communicators; in fact anyone who can meaningfully participate. Help us to find new and interesting uses for data used to plan and respond to emergencies, to stimulate new approaches to solving problems using public data, and to promote the use of open data to improve civil society. The video above provides a short introduction to InaSAFE. Dr. Trevor Dhu demonstrating InaSAFE to Indonesian President Susilo Bambang Yudhoyono at the 5th Asian Ministerial Conference on Disaster Risk Reduction held in Yogyakarta, Indonesia, October 2012. 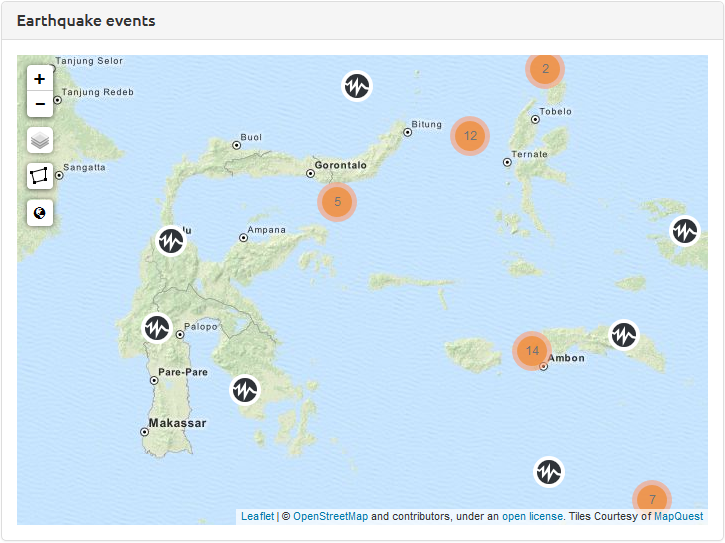 We run near realtime earthquake impact assessments following recent earthquakes in the Indonesia region. 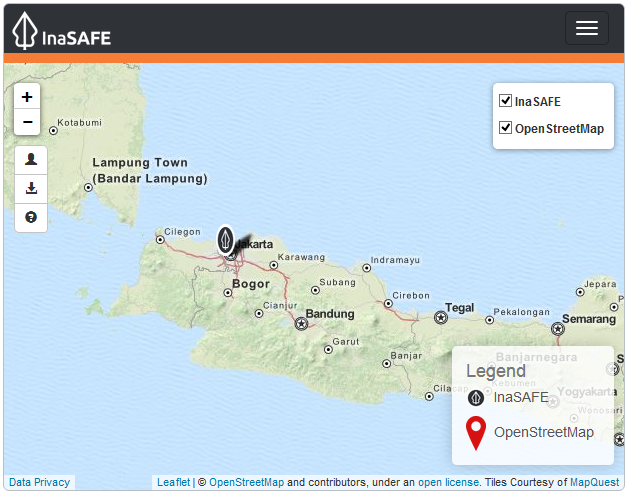 Shakemaps of earthquake ground shaking are produced by the Indonesian Agency for Meteorology, Climatology and Geophysics (BMKG) and used by the Indonesian National Disaster Management Agency (BNPB) to produce InaSAFE impact assessments within minutes of an earthquake.